To view the previous week's featured videos, visit my homepage and click on the title you wish to see. Is it Time to Speak up or Shut up? In my coaching and counseling practice, I talk with people who are in pain. Husbands fail to love their wives. Wives disrespect and hurt their husbands. Friends disappoint one another. Sometimes we struggle just to get along peacefully. Yet, Jesus said that we’re to be branded by our extravagant love for one another. Even more challenging is Jesus’ command to love our enemies and to forgive those who mistreat and hurt us. But how do we balance these commands of Christ with the biblical mandates to speak the truth in love, to be the salt and light of the world, to confront sin, to go to someone when they’ve sinned against us and to admonish the unruly? It isn’t always clear when we should simply put up with one another’s weaknesses and be patient with him or her or whether we should confront a person directly about his or her sin. Here are some guidelines I use to decide whether I should forbear or whether I should confront. First, forbearance is a very good spiritual discipline to practice. Jesus reminds us to take the log out of our own eye before we try to remove the speck in our brother’s eye. We all need to learn to live graciously with one another’s weaknesses and faults as we all have them. But forbearance doesn’t mean being passive or quiet when someone does something wrong or hurts us. Forbearance actively works to understand, accept, forgive and let go of an offense without ever talking directly to the person about it. I’m afraid that instead of practicing biblical forbearance, we often choose outer silence but nurse inner discontent, anger or bitterness. By keeping quiet, we may preserve an illusion of peace, but it’s not a biblical peace and often results in further conflict and alienation. Second, confrontation isn’t merely blurting out your thoughts and feelings at their moment of greatest intensity without any regard for the well being of the other person or the relationship. I liken that practice to vomit. Vomit feels better getting it out, but it belongs in the toilet and not on a person. Below are three reasons that confrontation may be the better choice in your relationship with someone. When Queen Esther was told of Haman’s wicked plan to have all the Jews exterminated, she knew that it was a not time to forbear but to speak out. She didn’t do it rashly, but prayerfully and thoughtfully. (Read the OT book of Esther for the story.) She was afraid, but she knew she had to confront. We are to be faithful to our friends and friendships and that means that if we observe someone caught in a repetitive harmful sin or habit, we need to speak to them gently about it. Do you have a friend who is flirting with disaster? Tempted with an affair? Being abusive towards their spouse? Playing with drugs? Abusing alcohol? So many people have told me they wished someone would have come along side of them and lovingly warned them before they fell of the cliff. Hebrews tells us to encourage each other day after day lest any of us become hardened by the deceitfulness of sin (Hebrews 3:13). When someone repeatedly or grievously sins against us, this is not the time for forbearance but for talking. Matthew 5 and l8 tell us that if someone has sinned against us or if we have something against another person, we are to go and make peace first before presenting our offering. Sometimes the relationship has been hurt or damaged by something someone has done. We can’t just forbear or forgive. Even if we’ve tried, we can’t let it go, and it’s eating us up. Now is the time to speak up or the relationship will deteriorate even more. You want to know how? Like Queen Esther did. We need to have a plan. Click here to read my free article on how to have a difficult discussion with someone. My Husband Has Dementia and is Becoming Violent. What Do I Do? Question: I was listening to your seminar on abusive marriages. It was interesting, but what if your partner has dementia and possibly developing Alzheimer’s and he’s increasingly mean and violent with you and others in the community? How do you handle that? Answer: Your question is an excellent one. We must also recognize that when abusive behaviors are not typical of someone’s patterns or have not been part of a couple’s marital history, there may be something physical going wrong which affects his (or her) thinking and behavior. 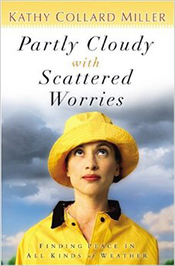 Partly Cloudy with Scattered Worries: Finding Peace in All Kinds of Weather by Kathy Collard Miller. Plus see the winner of the previous give away! Kathy Collard Miller is a speaker and author. Her passion is to inspire women to trust God more. She has spoken in 30 states and 7 foreign countries. Kathy has 49 published books including Women of the Bible: Smart Guide to the Bible (Thomas Nelson) and she blogs at KathyCollardMiller.blogspot.com. Kathy lives in Southern California with her husband of 43 years, Larry, and is the proud grandma of Raphael. Kathy and Larry often speak together at marriage events and retreats. To win this book, please email your name to assistant@leslievernick.com with "Book Give Away" in the subject line by midnight Sunday, November 3rd. The winners of “Experiencing Gods Presence: Learning to Listen While You Pray” books are Donna D. of Saranac, MI and Susan R. of Warren, OH. "The seminar was truly transformational as it met each of the attendees with a specific challenge to grow and heal. I have spent the last three days working with individuals who are ready and willing to take the next steps and who are looking to better apply the seminar to their lives. It was a real WIN!"